A perfect soft boiled egg breakfast. 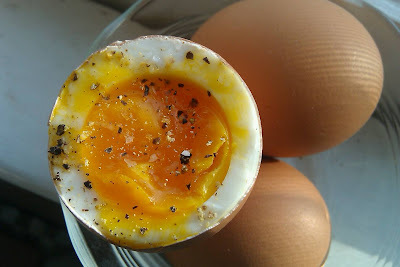 The tiny, creamy pleasure of digging one's spoon into such a perfect little egg. Thank you, Wil-Moore farms. Yum! I make poached eggs all the time for breakfast. I bought eggs at the grocery store the other day but then I saw these eggs I had forgotten about in the veggie restaurant by my apt. (in MX). They are from a women's co-op called "Mujeres con Huevos" which is a double entendre as it means "women with eggs" but huevos is also slang for balls and they are standing up to their community to sell eggs and make money for their families. I love it! Thanks Alex! Hi Erica! I love the name "Mujeres con Huevos" -- that is some savvy naming. Awesome! What is MX? High fives for the South Carolina Soapbox!